Carmine Appice is a legendary drummer, someone who started out in the 60ies with the psychedelic band Vanilla Fudge and from there on played and charted with people like Jeff Beck and Rod Stewart. In the Eighties, when hairspray was ruling the World, he came back with Blue Murder, a band surprisingly heavy for that era. At some time in Blue Murder, there were also Tony Franklin (ex-The Firm) on bass and Kelly Keeling (ex-Baton Rouge) on vocals. 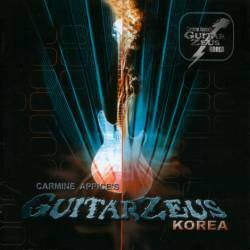 Blue Murder are history, therefore there's Guitar Zeus, Carmine Appice's project that started out in 1996. The first two Guitar Zeus albums featured American guitar heroes, the third one had Japanese guitar craft. Now it's time for the fourth volume, and this time the guitars have been played by Korean axemen. More or less, this is still Blue Murder, no doubt about it, but instead of having a regular guitar player, the core band records the basic tracks in the United States, and Koreans record their guitar tracks back at their home. Sounds sterile? But don't worry, Appice and Keeling who are responsible for the songwriting took care of the hit qualities, and so it all sounds very homogenous, ideal for anyone who loves 70ies tinged melodic hard rock with heavy guitars. The guitar players come from bands like Crash, Eve, Sinawe,... just to name a few, although I doubt anyone outside of South East Asia is familiar with those names. Anyway, these guys show that hard rock is also a force to be reckoned with in Asia, and even guest appearances from King's X's Doug Pinnick (vocals on This Time Around) and Ty Tabor plus Queen's Steve May don't add to the quality, but just blend in perfectly. This is an album as well for friends of melodic heavy rock as for six string connoisseurs. One of the really enlightening guitar albums that goes a lot further than anything you will ever hear from a Satriani or a Vai.